The FAQs provide you with answers to common questions. Contact our helpdesk for any problems not covered in the FAQ section. We are happy to help you. Access to the content of the digital library is with a reader card issued by the National Library or any other library of the Consortium Luxembourg. Find more information here: Reader card. We strongly recommend changing the default password immediately after your first login to prevent misuse of your user data. If you have forgotten your password, please use the link “forgot your password” in the login page. In this case, it is likely that your subscription has expired. Renew your subscription at the library you were last registered with. Find all information on the subscription process here: Reader card. Did you click on the link to the full text in a-z.lu, and then were you informed on the vendor’s web site that you have to pay for the document? Check the URL of the web site in your browser. Is there a proxy address “.proxy.bnl.lu”? If this extension in the URL is included, the vendor identifies that you are authorized to access the document. If this extension is missing, you can add it manually (see screenshots below) or simply install our LeanLibrary browser extension which does it automatically for you. This makes it so much easier to identify content your library has licensed for you while browsing the web as you normally do. If the message still occurs or you get a different kind of error message, this is probably due to an erroneous configuration, which has not been recognized yet. In this case, we would kindly ask you to contact the helpdesk so that the error can be corrected. You found an interesting document. You check the access option to the document and receive the information “Sorry, no full text available”. In the course of searching in a-z.lu, it can happen that you come across an article or a book with no digital full text supplement, or the library did not license the full text. 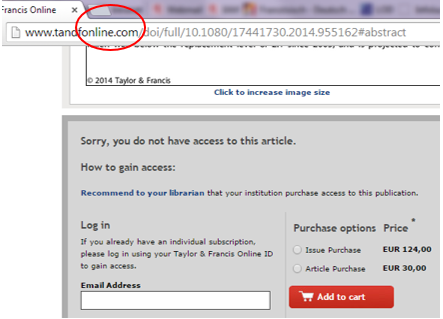 By clicking on “Online access”, you then find the message “Sorry, no full text available”. In this case, you can order the document via the interlibrary loan. This is a service offered by the National Library to acquire documents via libraries abroad. Since there is an additional administrational effort necessary, you will be charged a small fee. Some database content, especially legal information, can only be accessed within the library building. You receive an error message if you are outside the library’s network. If you recognize false information regarding availability of a document in the access options, click on the contact form and report the problem to us. Our staff will correct the mistake as soon as possible. Could it be that you are accessing the document from a network different to the one you usually use? In this case it is very likely that the firewall of the network is not configured correctly and is blocking the port which our link resolver uses. Verify that the Port 9003 is open in the firewall. To do so, type “sfx.etat.lu:9003” in the address bar of the browser. If the image does not appear on your screen, you need to check the firewall configuration, or contact your IT department to do it for you. You can also send us an email to Helpdesk.